When I was a kid it was a family joke that I had never read book cover to cover. I was always a “skimmer” – but the truth is I loved to read. To this day, I try to skip a page in every book I read so I can still “brag” that I never read a book cover to cover. My mother will point out that this claim may be true except for “An Unauthorized Biography of Farrah Fawcett” I read in seventh grade. But that is another story for another time. When I was in high school (in the early 80’s not the 50’s when they were written), I discovered the books of Mickey Spillane, the iconic writer of the hard-boiled Mike Hammer detective stories. I loved these books! I liked them for the crisp straight to the point writing and the fact that they were great stories told in a relatively short number of pages. I read most of Spillane’s catalog in a very confined period of time when I was about 17 and really never read him again. 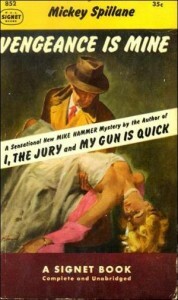 I do remember re-reading “I, The Jury” – the first, best and best known of the Hammer series – on winter break as a freshman in college, but that was it. Just recently, while browsing titles on Amazon, I came across an anthology series of Spillane’s work. While reading the titles contained in these volumes I was transported back to my youth and knew I had to buy one. Most of the books I read back in the day were used paperback purchased at flea markets. So having a brand new book with these classic tales in them was welcome. The novels have a nostalgic feel, not just because I am remember reading them, but the whole style. In a modern context the stories may seem quaint and derivative, but you need to remember that Spillane practically invented the genre. I realize that they may not be everyone’s taste, but if you have the chance, read one of Spillane’s novels, you will come to appreciate why he is an important figure in the evolution of popular fiction in the 20th century. Fans of the Cowboy may know already how much we love the Cape Cod town of Wellfleet , MA. Wellfleet is one of those places that offers so much in physical beauty that it has attracted a great community of artists over the years. There is great experimental theater as well as a slew of galleries with artwork from all over. It was on a trip to visit the galleries of Wellfleet last fall when I stumbled up the Blue Heron Fine Art gallery where I spotted to work of artist Greg Stones. Stones’ work is just the type of thing I like – realism with whimsy. You can be looking at a lovely landscape appreciating the beauty of it before realizing there is a zombie walking in the distance. Or grim reapers, sock puppet monkeys or skiing penguins. I love it! It takes true talent to be able to paint this well, but a true genius to mix the comedic and bizarre elements into something so compelling. Check out Stones’ art here. 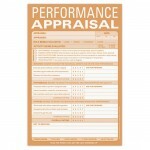 It is annual performance appraisal season at my day job. It is a process that never seems to be easy even though it can be important to those who are being evaluated. Anyway, the whole thing would be so much easier if we were to adopt a Performance Appraisal Pad like we found on Knock Knock. First, you got to love a website whose tag line is “we put the fun in functional.” Second, you have to love these pads, which are meant to help you appraise the performance of folks in your like outside of the office. Check out these pads and the other fun stuff at Knock Knock. You know how we love vintage and “retro” stuff here at Lost Cowboy. We have talked about websites we have found in the past, and we have a new one for you… Retro Redheads. There is some cool stuff here, nothing terribly different than what you can get elsewhere, but we like the fact that they have a niche and do not overwhelm with things that are peripheral to their main purpose. Take a look around, you will be sure to find some cool things. 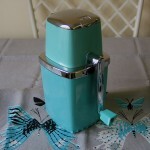 I like this Vintage 1950’s Turquoise Ice Crusher – which I am sure my grandmother had and was using well into the 80’s – that’s the 1980’s. Check out Retro Redheads here. You have heard me rave about the chocolates made by Hotel Chocolat before, but I wanted to share a specific story about one of their great products. While roaming around the Hotel Chocolat website looking for gift ideas, I stumbled upon their Vintage Dark Chocolate Buttons and was instantly intrigued. At the time I was in the midst of cataloging my mother’s massive button collection and thought how perfect the chocolate buttons would be to give to my mother for Christmas. Hotel Chocolat’s Vintage Dark Chocolate Buttons are described: “Straight from London ’s antique markets, these solid dark chocolate buttons are cast in authentic vintage button molds. 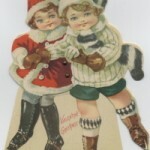 Exclusive, retro and distinctly dark, these make a perfect little something gift or personal indulgence.” How cool is that? Well, I purchased a couple of boxes, one for Sophie, who loved them, and one for my mother. My mother was thrilled to see them. Being diabetic, she wished she could eat them, but even at that she said they were “too beautiful to eat.” Well, she opened the box and looked at them. One by one she pointed them out: “I have that one… I have that one… I’ve seen that one in book…” Truly amazing. I knew my mother had something special with that collection of buttons, but every day I appreciate it a little more. The museum offer some nice exhibitions, often focusing on folk art or other American art forms that larger museums may not even consider. The museum is currently showing the “Valentines from the Kaman Collection, 1910-1920” featuring some of the great works of art that were the Valentines of the early part of the last century. Whether or not you can make this exhibition, we suggest a trip to the National Heritage Museum if you ever find yourself in Lexington. Especially if you are around for the extraordinary reenactment of the Battle of Lexington which happens every April on Patriots’ Day in Massachusetts. Worth the trip for a little splash of history. Visit the National Heritage Museum online here. Who doesn’t like chocolate? Well, I really don’t, but that doesn’t stop me from appreciating it and the way people go crazy over it. We’ve covered the fancy high-end creation of Hotel Chocolat – that’s old school European. Now, I have found the new world Taza Chocolates of Central America. Somehow “socially responsible” and “certified organic” sounds like it can relieve the guilt of overindulging in chocolate – which sounds good to us. 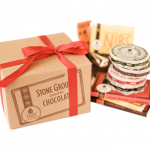 Check out Taza Chocolate here. I meant to mention Hotel Chocolat at Christmastime but never got around to it. Now, with Valentine’s Day only ten days away it is the perfect time to rave about the treats this British chocolate offers. I discovered Hotel Chocolat while walking down Boston ’s Newbury Street in December, shortly after they opened their very first US Retail location there. I am not a fan of chocolate, but as a fan of anything British (file this under “Anglophile”) I was intrigued. I was instantly attracted to the gloriously displayed treats and knew that they would make the perfect holiday gift for the folks in the office and great hostess gifts. I am embarrassed to say I loaded up on the stuff and then placed an even larger order online. The chocolates came in cooler with ice packs to make sure the chocolates did not melt. I thought that was very cool. I made gifts of the candy to a dozen or so of my associates and everyone raved. Now with Valentine’s Day approaching, I went back to the Hotel Chocolat site to see what they were offering and I was not disappointed. I love the idea of the “Magnificent Heart – Fruit & Nut Bliss” which is described: “unleash the darker side of Valentine’s Day, if you dare… with broodingly dark yet smooth chocolate, succulent raisins and cherries and the thrilling crunch of hazelnuts and pecans. 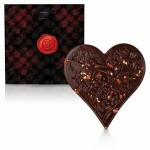 A chocolate heart shaped gift for those with adventurous tastes.” Sounds perfect to me! Remind me to post the story about the Vintage Button chocolates Hotel Chocolat makes. Check out all the Valentine’s Day treats available at Hotel Chocolat. I remember once when I was a kid watching my mother in a panic as she received a last minute invitation to an afternoon tea party and had nothing to bring. We were at our summer place where these afternoon tea parties were a big deal with the local women, most of whom were there to spend the summer by the lake with the kids while the men folk worked in the city and came up at the weekend. My mom didn’t drive which meant that my dad would make sure we had enough groceries and ot her supplies for the week before he left on Sunday evening. This also meant that by Friday there was not much left it cupboard or fridge to throw something together at the last minute to bring to a tea party. So there was mom, trying to think of something. Before I knew it, she starting working feverishly. She took a can of SPAM, and let me open it. This was a fun activity for a small boy. Then I watched as she chopped it up into small pieces and put it into a bowl. The she chopped up some pickles and an onion and tossed them into the bowl. She added some mayonnaise and mixed all together. Then she took a platter and spread crackers over the surface and then put a dollop of the SPAM mixture on each cracker. She went off to her party and when she came back she was full of stories of how the ladies raved about the little treats and refused to believe it wasn’t something picked up at a gourmet grocer. I learned much that day. 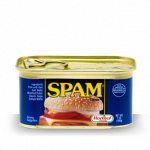 I learn you should always have enough things on hand to be able to throw together a quick app at a moment’s notice – and I learned that SPAM is your friend. Check it out, you may be surprised what you can do with those cans of SPAM you have in your Y2K bunker you need to turn over. I am going to admit it… As easy and cool as digital photography is, I really miss old school film cameras. There was something special about snapping a picture and hoping it would come out. There was nothing like the anticipation of seeing what shots you got on your vacation after it was all over. Some purists will say that there film photographer is superior to digital in an aesthetic way. But we just miss loading the film and being mindful of how many pictures we had left on a roll to make sure we took pictures of only the important stuff. Anyway, I was thrilled to come across Four Corner Store, a website dedicated to “all things toy camera.” On Four Corner Store you can find all sorts of fun cameras, mostly plastic film cameras that will make you feel nostalgic. 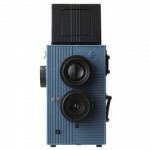 Check out the Blackbird, Fly 35mm TLR in Blue – very cool. You can also find all sorts of accessories including film. I was particular happy to see the 110 film cameras – I had totally forgotten about 110 film. My very first camera when I was in first grade back in the, ahem, 1970’s was a tiny 110 camera. Now only if I could find a Flip Flash… Does anyone else remember the Flip Flash? See all the toy camera and accessories Four Corner Store offers here. Lost Cowboy is powered by	WordPress 5.0.4 and delivered to you in 0.927 seconds using 64 queries.